Love it or hate it, all cyclists eventually end up riding in the rain. Fortunately, there are lots of tricks to making the experience of wet weather cycling more enjoyable and safer. 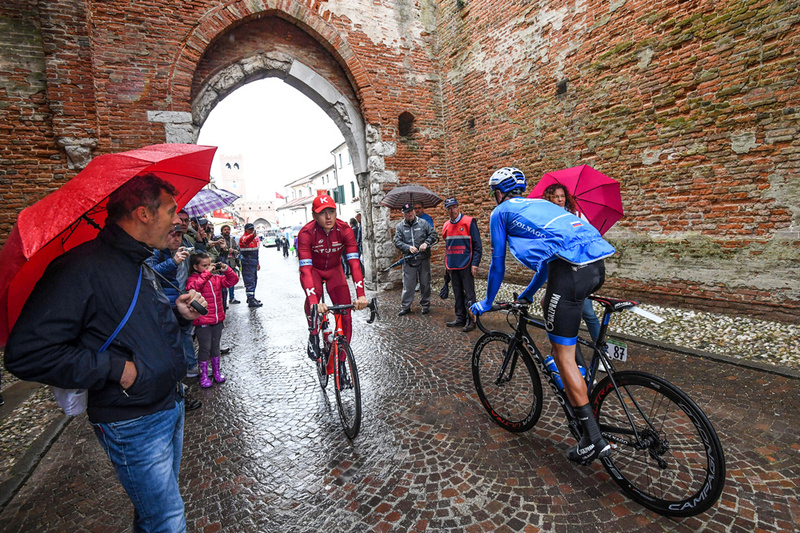 Here we offer pro tips about what you should do before, during and after your next rainy ride. 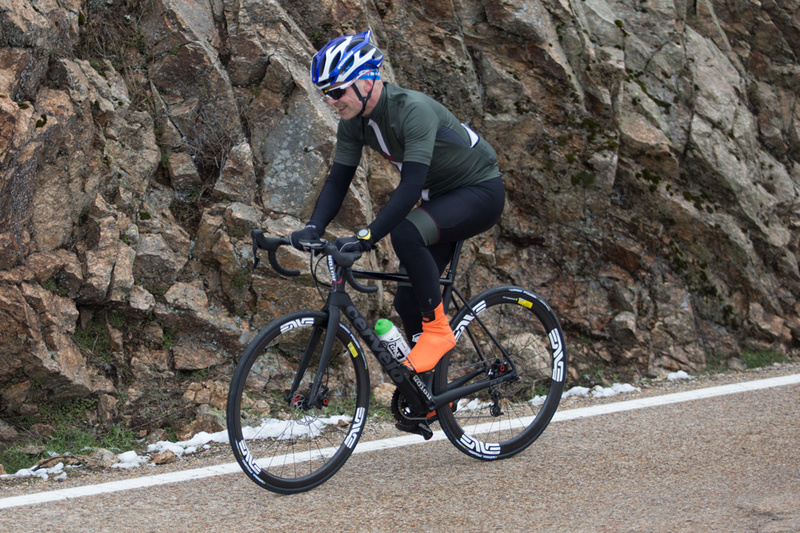 Start with a warm, wicking base layer such as a wool jersey, add intermediate insulating layers if needed and top it all off with a rain jacket. When it comes to jackets and tights, know the difference between water resistant and waterproof. Water resistant clothing tends eventually soak through but is more breathable while less permeable waterproof garments are typically better at keeping the wet out at the cost of not breathing as well. To keep your extremities dry, don waterproof gloves and cycling socks or shoe covers. For added warmth on the cold, wet days, add chemical hand and toe warmers inside your gloves and shoes. Or use a pair of rechargeable electric heated insoles in your shoes. Last but not least, something as simple as a pair of the light, but highly portable Rainlegs will help your upper legs stay dry. Poor visibility comes along with wet conditions, so it’s important to do what you can to improve your chances of being seen by passing motorists and other road or trail users. Wear reflective or high visibility clothing, and add lights and reflectors to your bike. You’ll also see better if you use clear or rose tinted lenses in your glasses instead of the dark lenses typical of sunglasses. Avoid road spray and trail muck coming up and off your wheels by adding front and rear fenders to your bike. Many modern fenders feature clever attachments for easy mounting and removal, which is ideal if you don’t want to permanently install them. Wet conditions mean less traction so you’ll need to allow greater stopping distances and take your corners more slowly. Start to brake sooner and modulate your braking to reduce the chance that your wheels will lock up and subsequently slip out due to broken traction. Also scrub speed before corners rather than braking in them. Finally, don’t brake on slippery surfaces like painted lines on roads and on metal grate and wooden bridges. These become like ice when wet. When you get wet, you’re more susceptible to getting cold. Hypothermia can quickly become a real issue in cold, wet conditions. So keep moving and avoid prolonged stops because your body naturally produces heat while you exercise. Puddles can hide potholes or other road debris that can cause flats and crashes. Pedal around puddles if possible. Likewise, avoid visibly slick spots such as where you see residues of oil or gas on the road. Change into dry clothes as soon as possible after you stop riding. You’ll not only stay warmer but also healthier by eliminating conditions favorable to skin infections. Once changed, don’t let your wet clothes linger; instead rinse them outside using a hose to remove grime then put them directly in the laundry for a more thorough cleaning. It’s much easier to get dirt and road grime off your bike before it dries on. Use a hose, soap and a brush, sponge or cloth for best results. Once you’ve cleaned your bike, don’t just put it away. Be sure first to lube all moving parts like your chain, pedals and any accessible cables. Your bike will then be much more likely to work well for your next ride. Don’t forget to dry out your small bits such as the contents of your jersey pockets, saddle bags and backpacks. Your helmets and shoes will also hold up better over time if you leave them out to air dry. Removing insoles and stuffing your shoes with old newspaper is a time tested trick for speeding up the drying process.